Posted by Donald Morse Jr. Since this is my first post here, I have decided to share with you how I first got interested in birds. I have often been asked (by birders) "What bird was your spark bird?" or (by family and friends) "How did you ever get started watching birds?" I probably answered with "I don't know for sure, maybe the Ruby-throated Hummingbird" or "Watching a hummingbird". I was fascinated by many birds when I was young, so I never really put much thought into the one bird that started the ball rolling. But as I look back, I remember one bird that I could not ID for anything. I was only 11 years old at the time and wasn't what one would call a "birder". I did not own a field guide, but I often would look at my dad's old Golden Guide to Birds. It only contained the most common or most likely to be seen birds, plus some of the pages were missing. The bird that I was seeing was not in it. I remember asking my dad and grandfather what the bird was with the response "I don't know". Back then, there was no Google, I didn't have the internet. I searched and searched to no avail. I then started on a mission to find out what bird it was that I was seeing. I remember seeing many of them flying over the fields around my house in the evenings. I thought to myself that they must be some kind of seabird. Given their shape and flight style, I thought maybe a gull or a tern at the time. I started to look at more bird books and my grandmother bought me a membership into the Cincinnati Nature Center. Before I knew it, I had become a birdwatcher. Oh yeah, that bird? 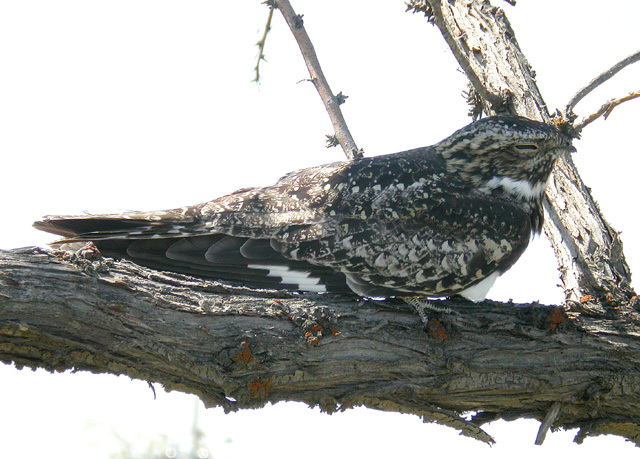 That's right, the Common Nighthawk (Chordeiles minor). I don't remember how or when exactly I came to the conclusion as to what those odd, crepuscular birds were that I was seeing. I only remember there were many of them and that they were quick fliers. Today, I don't see nearly as many as I did when I was younger. I remember watching them for long periods of time as they migrated south around the end of August. They seemed as if they would never stop coming, a constant stream of birds. 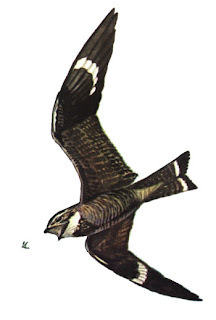 I also later participated in a project designed to learn more about the Common Nighthawk's migration called Project Nighthawk (from 1999-2005). This also heightened my interest in the Common Nighthawk. Participation in this project put me outside for the last two hours of daylight of every day from mid-August till I stopped seeing nighthawks. I still look forward every year to seeing the large, migrating flocks of Common Nighthawks on their southward journey! Wonderful post. I was tickled because this same bird launched me from being a backyard birder to wanting more!!! I used to work out in the backyard and hear this special fluttering sound and look up and see a nighhawk coming almost straight down and then stop and pull up. The sound those birds generated fascinated me and I have been saddened ever since the barn where they lived was sold and became home to old cars. The birds left. My wife is a wildlife rehabilitator, and we have had a few of these come through our doors. They are beautiful birds and worth the time to seek out. We have also traveled to Brazil and seen its cousin the Great Potu. Both are wonderful birds. Very nice post Donald! What a fantastic bird to capture the imagination and heart of a young man.